Women typically carry less muscle mass than men, and our hormone profile makes it harder to build muscle at the same rate as men. That means relatively speaking, we are weaker. Now, a top female strength athlete may be stronger than the average man, and sometimes stronger than even a very strong man. That is pretty rad, but beside the point. I don’t lift just so I can be stronger than some men (though it’s a perk, I admit). I lift so I can be the strongest version of myself possible, but being female-bodied sets me up to make that a little bit harder. Okay, maybe a lot bit harder. If my relatively untrained 22 year old brother is out of the gym for 5 months, he will be back and easily benching my 1 rep max for high reps in no time. It won’t be that easy for me. This is not to imply that men don’t train hard for their progress, but until you have spend months trying to put on upper body mass and put MAYBE 5-10 lbs on your bench, you just don’t understand how hard it can be. This is where bodybuilding comes in. I hear a lot of women complain about their lagging overhead and bench. “My lower body is just stronger,” and “I just have weak arms.” Well, yes, and there are reasons for that. Women hold our center of gravity lower typically, and our bodies naturally store more fat and muscle around our hips and thighs. This is great news for our squat and deadlift, but bad news for anything upper body dominant. The good news is that working in the 8-12 and 10-15 rep range, the hypertrophy range, can help us build up very functional mass. Every once in awhile I hear bodybuilders’ muscles referred to as “glamour muscles,” implying they are all form no function. While in intention that may be true, stage competitors work out to look a certain way, that does not mean their muscles are somehow fake or “pumped up” (except after a sweet arm sesh, bro). 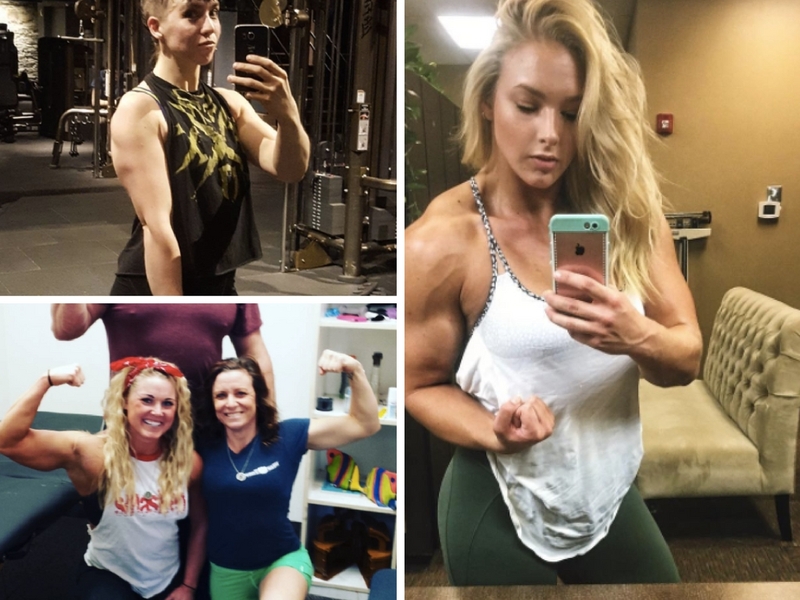 They often will not have the static strength of a powerlifter, but if a female stage competitor decided to start training for strength only, she would have a huge advantage over an untrained woman with no bodybuilding background. This is because more muscle mass means more strength potential. You literally have more tissue designed to move and fire, and thus more tissue to help you move big weights. Of COURSE you can be very muscular without ever doing anything over 6 reps. But if you are female bodied, you are going to give yourself a much better chance of maximizing your strength capacity with a little more muscle on you. That may seem like an obvious statement, but women can’t hear it enough as far as I am concerned. I have written about how women face unique challenges when it comes to getting stronger and getting bigger. If you are comfortable with the idea of gaining a little mass but aren’t sure if the time it takes is worth it, consider a few things. The more body you have and the longer your limbs are, the more work those limbs have to do to move anything. Think about it – if I am 6 feet tall and deadlifting, the bar has farther to travel than someone who is 5’3. The longer your limbs are, the more help they need moving weight, and for women especially, work in the strength range is not enough stimulus to create much extra mass. In lifting, we can think of the body as a system of levers, and the longer your levers (arms, torso, etc) are, the more mass you may need to move that weight. This is a simplification of course, and you will see lifters who are very strong but smaller than bodybuilders of the same build and height. Size does not necessarily mean more strength. But it means more muscle that can become very strong. Proprioception, or body awareness, is a skill that can take a long time to develop and comes more naturally to some than others. I am very grateful to have started with a slightly more bodybuilding oriented training style, because doing tons of reps with smaller movements really helped me identify when and how muscles were firing or not firing. I have much better awareness of my body in space. There is something called mind-muscle connection, which is essentially another phrase for proprioception. It’s not magic, it is learning to mentally connect to a muscle and actually help it fire better while you are working it. For example, engaging your lats (latissimus dorsi) is really helpful in the deadlift – Flex your lats, right now, in your chair. No idea how to do that? Then hypertrophy work can help you. The ability to activate a muscle, feel it working, and the added awareness of how your body is moving through space will increase your strength potential and athletic potential. I remember the first time I was able to feel the stretch and engagement in the bottom of my lats during a set of pull ups and it was like learning I had a new bodypart; revelatory, empowering and a little weird. Having little “aha!” moments like this will help you cultivate an exploratory approach to your hypertrophy work as well – you are learning to feel your body from the inside out, and this will only improve your performance on your big lifts. If I’m at the end of a training cycle and my fatigue has accumulated greatly, getting training in is hard, hard work and as satisfying as it is, I’m wiped out by the end of the day. When I’m doing more bodybuilding, I can train more throughout the week, but not be as tired. Then by the time I get back to really heavy weight, I am rarin’ to go and feel super powerful. This is especially nice if you started lifting as a way of taking ownership of your body and building a positive body image: you are spending more concentration feeling connected to your body, which in my anecdotal experience, can have really positive mental benefits. There are many smaller muscles in your body that can get a little less love from just the big compounds, but if developed more, would positively contribute to your big lifts. The rear delts (back of the shoulders) come to mind. Our shoulders take a beating with high pressing volume, and giving the rear delt tons of a love is crucial to preventing imbalances that can lead to injury. Injury means time out of the gym, which obviously we want to avoid. If your upper body is nowhere near as strong as you want but your only upper body is bench twice a week and correlating sets of rows, you need to think about how you are maximizing your body’s potential. 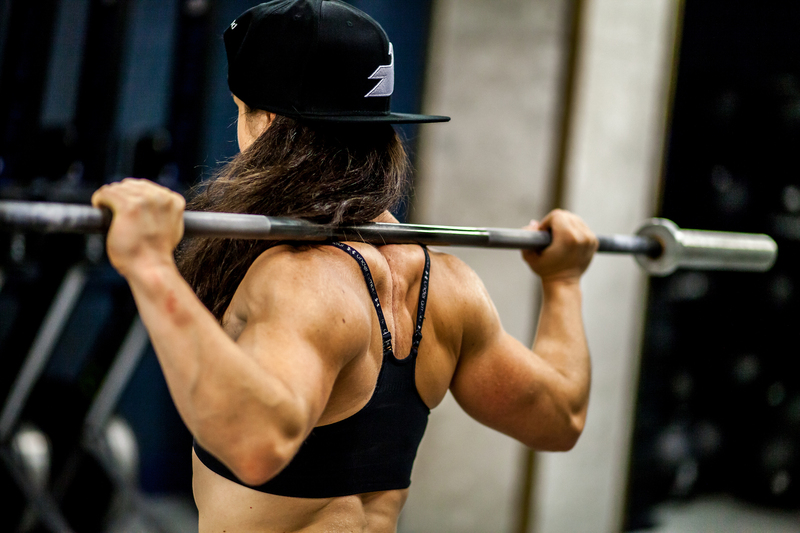 Women can handle a lot more volume at higher percentages in training than men can. Which means we can reasonably fit in multiple sets of 2-3 exercises with weights closer to our 1RMs than men can. Which is good, because due to our lack of testosterone, we NEED more overload to grow. Yes, just benching for 3 sets one day a week will make you stronger. But benching/pressing 8-15 sets multiple days week for a 6-8 week period and will make me denser or bigger, have more muscular endurance AND make me stronger. Hypertrophy work is a crucial part of strength development; it builds body awareness, endurance, and strength potential. While as you grow more experienced you may need less of it (2 to 3 cycles of 6-8 weeks out of the training year, for example, more or less depending on your competition frequency if you compete), it is a critical part of a female strength athlete’s development, especially for any woman who has been lifting for less than 4 years. If you are not sure about how to go about programming hypertrophy consult a coach or programming service/coach that has been vetted by other coaches you respect, or ask for advice from women who have more experience. When starting out, don’t be afraid to get a little experimental. Try just adding in a few a extra sets of rows and arm work in for a few weeks and see what happens. When I first started lifting, I would pick 4 chest exercises on my bench focused day and just get silly with the rep ranges and tempos and so on. While eventually a structured approach is best for long term measureable progress, you want to feel your muscles work in as vast a variety of ranges as you can; this will help you build the mind-muscle connection I mentioned earlier. And you don’t have to dedicate all your training time to hypertrophy while you’re doing it either; just start dabbling. Who knows, you might start thinking about getting into bodybuilding (not me though, I don’t have the discipline to say no to a burrito). Whether you decide to dedicate a whole training cycle or four to hypertrophy, there are serious literal gains out there, just waiting for you to find them. Now go do some curls!